StockMarketEye can automatically download recent quote data for stocks, ETFs and mutual funds from most major world exchanges. NOTE: An updated version of this page is available in our User’s Guide. For some securities, however, StockMarketEye may not have access to recent quote information. Securities such as bonds and preferred stock as well as items such as real estate will not have quote data available. Some mutual funds (such as Canadian mutual funds or some UK mutual funds for example) also do not have quote data available. You can still include these securities and investments in your StockMarketEye portfolios, however. Here’s how. 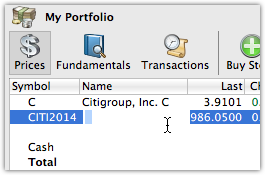 Example #1: Citigroup Inc issued bond, 5% yield, maturing in 2014. As our first example, let’s take a corporate bond issued by Citigroup. The first thing to consider is what ticker symbol you want to use in StockMarketEye to represent this bond in your portfolio. 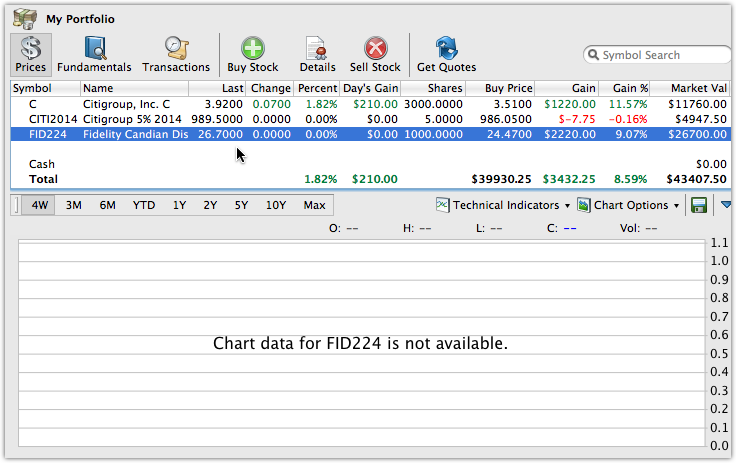 As StockMarketEye does not have access to quote data for this bond, using the Symbol Search will not turn up any symbols. So we need to invent a fake symbol that will represent the bond in our portfolio. 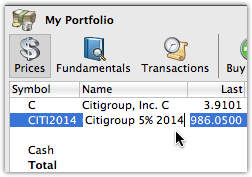 For example, in the case of the Citigroup bond above, we might choose CITI2014. Another option for our example is to use the CUSIP number. In this case we would use 172967CQ2. You are free to choose any symbol you want, but the key is to choose a symbol that is meaningful to you and one for which StockMarketEye does not already have data. 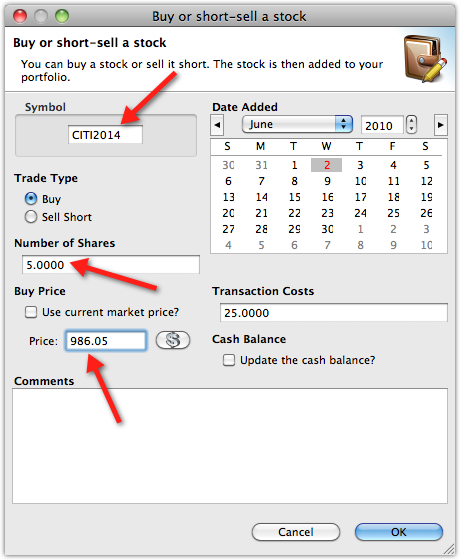 You can verify this by typing your chosen symbol into StockMarketEye’s Symbol Search field. The search results area should be empty. Now that we have our ticker symbol, we can add it to our portfolio as we would add a normal stock. 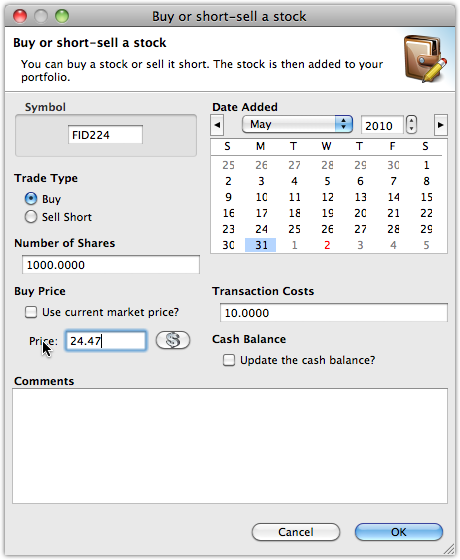 Click on the “Buy Stock” button in the toolbar to open the “Buy or short-sell a stock” window. 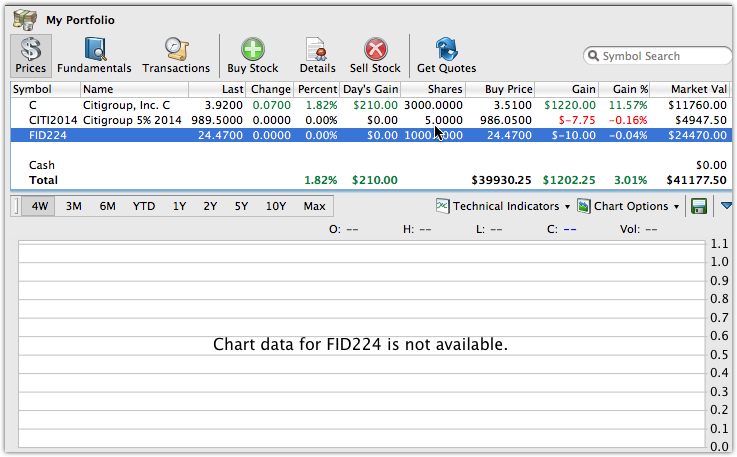 Then enter the choosen ticker symbol and other pertinent data. In the image above, the important fields are highlighted with a red arrow. You can see that we set the “Number of Shares” to be 5, meaning that we are purchasing 5, $1000 par bonds. The “Price” field we set to the purchase price, which in our example is $986.05 per $1000 par bond. Click OK to add the bond to your portfolio. 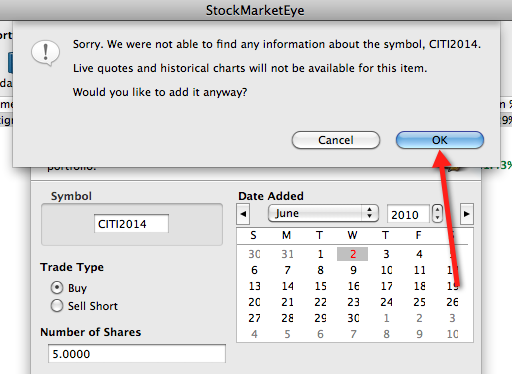 StockMarketEye warns us that it does not have access to any data for the symbol, CITI2014. We can safely click OK as we will enter the current price quote ourselves. Your portfolio will now look something like this. 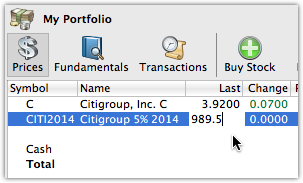 We’ve also added a holding of Citigroup stock to our portfolio. You’ll notice that the “Name” column is empty for our bond. We can add our own name by editing this field. 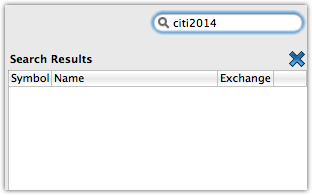 To do this, with the CITI2014 item selected as it is in the image above, click in its “Name” cell. Then type the name you want to give this item. 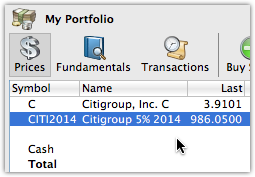 In our example, we’ve choosen “Citigroup 5% 2014”. When you’re done typing the name you want, press Return to have StockMarketEye remember it. Now let’s say that the price of the bond changes. 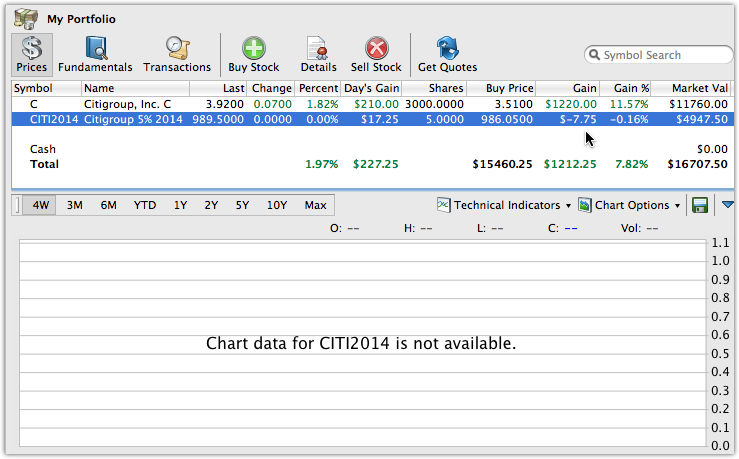 StockMarketEye won’t be able to update the price automatically, but we can edit it manually. As we did to change the “Name” cell, we can edit the “Last” cell to change the current price and compute the value of our holding. 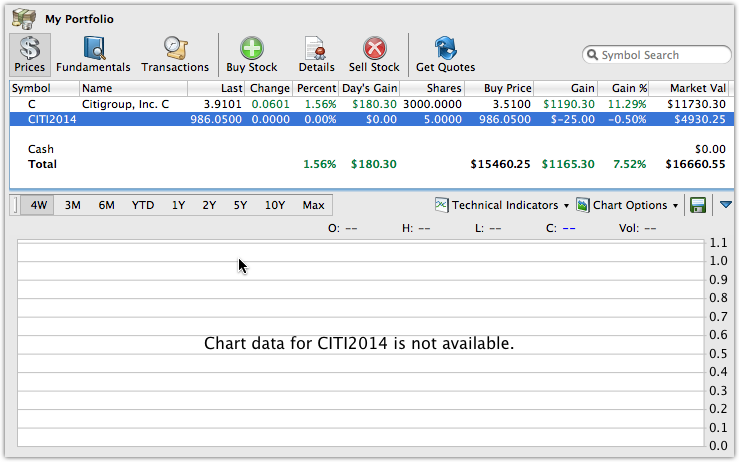 Select the CITI2014 line and click in its “Last” cell, then type the new price. In our example, let’s say the new price is now $989.50. As you can see in the next image, the prices have updated to reflect the new value of our bond holding. Update the “Last” cell like this any time you want to bring your bond holding up-to-date. The same principles from our bond example above can be applied to other security types. Let’s take the Canadian mutual fund, Fidelity Canadian Disciplined Equity Fund. This fund has a “Fund Code” of FID224 so let’s use that as our ticker symbol. In the “Price” field we entered the NAV. Now we’ll edit the “Name” cell and set a new “Last” value for the fund. You can update the “Last” cell value every day or whenever you want to bring your portfolio up-to-date with the lastest prices.